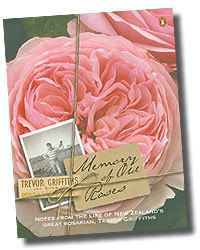 We visited the botanical gardens in Wellington not long after we had arrived in New Zealand and came upon a book called Memory of Old Roses by Trevor Griffiths. We bought the book for my parents as they are keen gardeners and it came highly recommended from the bookshop. The layout was superbly designed and we thought it would be worthy of any gardener's book collection. Now that we are home I decided to actually read the book and was so moved by it I felt it warranted a post. It's the sort of book you could read in a day and although I am not particularly interested in roses found the book hugely pleasurable. It is an autobiography of Trevor Griffith's life and "evokes innocent times when people worked long and hard to reach their goals." It is a gem of a book in my opinion and my only regret is that I didn't read it before posting it home. Trevor Griffiths nursery was based in Timaru in the south island and although he is retired there is a public rose garden in the town that might be worthy of a visit provided that the old roses, that bloom only once a year, are in full flower. For me this book is not so much about roses but a different way of life. The humility, matter-of-factness and simplicity of the writing echoing the times it describes. Just in case you are wondering, my parents liked it too.